The name of Selim Nurminen has been closely associated with the Tumlaren almost from the beginnings of this class in Australia. The same name adorns many a trophy for competitive sailing, and by many would be spoken of as one of the masters of the class in this country. In the Tumlare Yvonne, Selim has won many a class championship, and at one time held the title for more than a decade straight. Selim’s close ties with the class began while he was working as crew and boat manager for a prominent yachtsman of Port Phillip around 1940. Aged 87 when interviewed in the late 1990s, but now passed away, Selim remembers well the days 70 years ago, when he was 17 and had started sailing in square riggers around the Baltic. 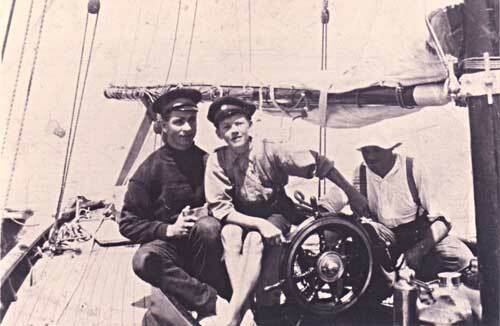 The picture shows Selim on the left, on board Hurrica V, with a young Harry Clark trying his hand at the wheel (see Harry’s story in the 21-footer article). Selim and Harry spoke with each other afterwards, not having seen each other since those days, after the connection between them was made via this photo. But I’ll let him tell his tale. “I’m actually from the Aland Islands between Finland and Sweden. They got their own flag, and are part of Finland, but I’m Swedish speaking. “In 1926, I was crew on the Ponape, a cargo ship. We had a load of timber from Norway to come out here, but we had a very bad trip coming out, a slow trip. We got head wind entering the English Channel, so we had to turn round and go around right to the north of Scotland and to the North Atlantic, and we had head winds and so on, so that made us a very slow trip. Around 80 to 90 days should have been the normal trip, but having the bad conditions we had a slow trip. “The thing was, when we got here we lost the wheat cargo that we should have taken back to Europe. So the ship had to wait for the following season’s wheat crop. And quite a few of the boys just walked off the ship ashore. It wasn’t the right thing to do actually, but the owner of the ship was pleased that we did so, and the skipper let us go. Because they didn’t have to pay us then, see. But they’d have to get the new crew. Some stayed on of course. But quite a few of us left the ship, and that’s how I came to be here. “Actually it was the third officer on board the ship, coming out here, who got me that job. He knew another man who wanted someone for work. But you see he couldn’t go. It would have affected his ticket. So he got me to come and crew on this yacht, which is how I got that job. “Later, the owner gave me a very good recommendation to work at St Kilda (yacht club), which is how I came to the Tumlaren. I was in charge of Joe White’s Acrospire yacht (68 feet long) when they introduced the Tumlaren class for Port Phillip Bay area in 1937, and when Joe White, who also had the Tumlaren Yvonne, retired, he gave me the option of sailing Yvonne, so that’s how I came to be on Yvonne and skippering her (now in South Australia and called Trillion). I believe Acrospire is in Western Australia now. “And so I’ve been lucky. I’ve always had work that I like. So from then I have been in the Tums for years. I’ve won 17 state titles. On the odd occasion, Bill Gash is able to take Selim out for a bit of a sail on a calm day. Transferring from dinghy to boat and boat to dinghy can cause a bit of a problem, says Bill, but, as Selim puts it: “It is good to feel the tiller again. Oh it is a great feeling.” On such days, says Bill, wresting the helm from Selim’s hand can prove difficult.